Baby Ruth Villarama’s Jazz in Love will open the 9th Cinemalaya Independent Film Festival and Competition on July 26, 2013 at the Cultural Center of the Philippines. Jazz in Love, based on a true story, is about Jazz, a gay Pinoy, who prepares for the visit of his German boyfriend by taking the qualifying language exam at the Goethe Institut for fiancées who plan to apply for a visa to Germany. The film presents a portrait of a couple very much in love. The German visitor, though, is overwhelmed by Philippine realities that may not end happily for Jazz. Jazz in Love was the recipient of the Regal Prize during the Manila Film Financing Forum of the 2012 Cinemalaya. 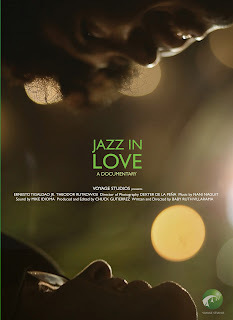 Jazz in Love is the first independent documentary film of Villarama. For the past 10 years Baby Ruth Villarama has been involved in documentary and narrative film production in the Philippines and the SE Asian region. Having begun with producing films and researching for international organizations, Villarama has since worked with the British Council, ILO-UNDP, National Geographic Channel, Mediacorp, Bloomberg TV, and CNN among others as a foreign correspondent. Her production team, to which she worked as a researcher and field producer, received an award at the 2007 UN film festival in New York for a documentary “Burden of Gold”, a film on mining that has been used as reference for many advocacy campaigns in the years to come. She eventually co-founded Voyage Film Studios, which provide assistance to international and local independent filmmakers doing stories in the Philippines and its partner country regions. Her advocacy on championing social issues using films is greatly reflected on the global Filipino films her studio has produced and supported since 2009. Jazz in Love will be shown at 7 p.m. following the Cinemalaya opening ceremony, which starts at 6 p.m. The event is open to the public. Now on its ninth year, Cinemalaya is a project of the Cinemalaya Foundation, Cultural Center of the Philippines (CCP), Econolink Investments, Inc. and Film Development Council of the Philippines. It is an all-digital film festival that aims to discover, encourage and honor cinematic works of Filipino filmmakers that boldly articulate and freely interpret the Filipino experience with fresh insight and artistic integrity. Cinemalaya will run from July 26-August 4, 2013 at the CCP, TriNoma, Greenbelt 3 and Alabang Town Center. Cinemalaya will feature 25 news digital films in competition, about 70 films on exhibition. It features a variety of sections, namely the Ani, Cinemalaya Documentaries, Cinemalaya Premieres, Retrospective: Urian’s Best (The Gawad Urian Best Film 2000-2009), and tributes to Marilou Diaz-Abaya, Celso Ad. Castillo and Eddie Romero. The Cinemalaya Film Congress is a major part of the Festival. There will be other film-related activities such as the Philippine Independent Film Makers Multi-purpose Cooperative’s 3rd Manila Film Financing Forum. For more information, please call CCP Media Arts at tel. No. 832-1125 local 1704-05 and the CCP Box Office at tel. No. 832-3704.